I used the product for a little while and I honestly was not that impressed. I was not much for the texture as I thought it was a little too thick to be applied easily. Every time I apply the product I get this very sticky feeling on my lips for a few minutes. It feels like I coated my lips with glue of some kind; it is really quite annoying. My husband did not like when I used the product either because every time that he kissed me and I had it on, he said that it left a gritty sticky film on his lips. and just threw the tube away. I thought about using it in conjunction with other lip moisturizers but I decided that it was not worth it and just tossed it. trust with it. This way if it does not work, you already have one on stand-by that you know works and would give you the relief that is needed. Like I said I would not buy it again. I did not see anything that was overtly good about this product. I am sticking with Carmex now as my go to brand and if I buy other brands I always make sure that I have Carmex with me. 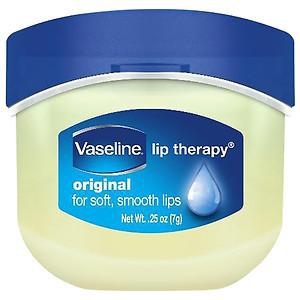 I give Vaseline Lip Therapy a three out of ten (3 of 10) because even though it did not work it was a decent price and I have seen it work better for other people.